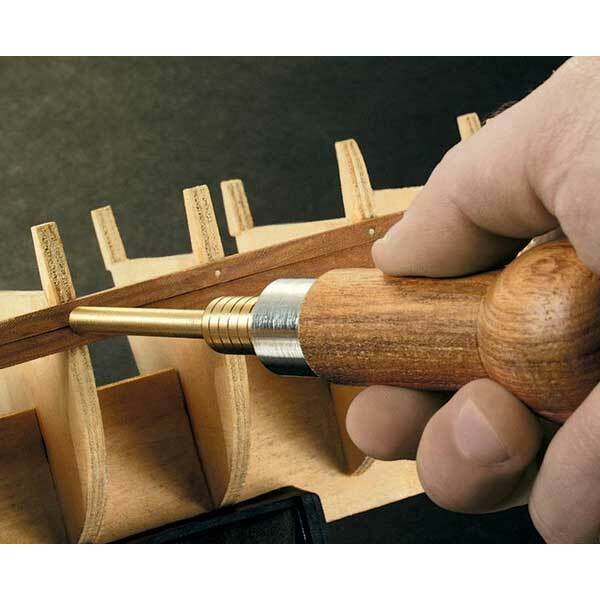 Ship modelers, dollhouse builders and model railroaders know that driving a small nail by striking with a hammer can be frustrating and time-consuming...chances are it will either bend or go in crooked. Our Push Hammer solves these problems better than any other tool. Just insert nail into the spring-loaded barrel and push. Fasteners are driven straight and fast every time. Comfortable, ball end design makes pushing with your palm easy and accurate. Made to Micro-Mark specifications of machined brass and steel, with hardwood handle. Overall length: 7 inches. For use with nails with head dia. from 3/64 inch to 3/32 inch.